Corey Keyes, Ph.D., a professor of sociology at Emory University, served as our keynote speaker for the Priester Awards Luncheon at the recent National Health Outreach Conference in Bloomington. Source: Keyes, C. (2014). Mental health as a complete state: How the solutogenic perspectives completes the picture. In G.F. Bauer & O. Hammig (Eds. ), Bridging occupational, organizational and public health: A transdisciplinary approach. New York: Springer Publishing. The absence of mental illness does not imply the presence of mental health. 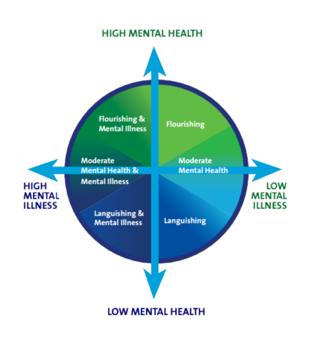 A person is considered “flourishing” if they have emotional, psychological and social well-being, which are measurable states.“Languishing” can contribute to poor health and functioning as much as “mental illness. Here’s the key point: Promoting and protecting positive mental health is as important as treating mental illness. As professionals working with children and their families, we have a role to play.